The Garden City Orchestra with the Shiki-Japaese Traditional Music Group is delighted to present 'Pacific Overtures'. 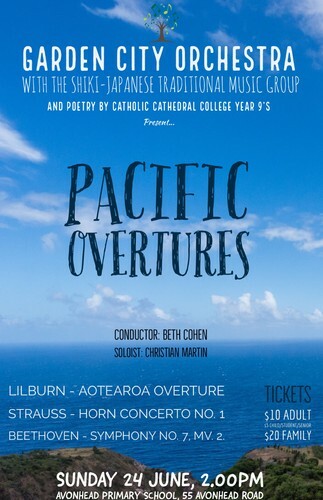 The concert features traditional Japanese music alongside Lilburn's Aotearoa Overture, Beethoven's Symphony No. 7, Mv. 2, Strauss' Horn Concerto No. 1 and a suite of Duke Ellington music. It also includes poetry by Yr 9 students at Cathedral College. The concert is Sunday 24 June, 2pm, at Avonhead Primary School (55 Avonhead Road). Tickets are $10 adults, $5 child/senior/student or $20 family paid cash at the door. A bake sale is included at the interval.